Miyamoto: "I Never Said Games Are Art"
The creator of Mario, Donkey Kong and Zelda said that he considers himself more of an entertainer than an artist. Shigeru Miyamoto is the designer of some of the most loved videogames franchises of all time, including Mario Bros. and Zelda, but also F-Zero, Animal Crossing and StarFox. For his achievements, he was awarded a BAFTA (British Academy of Film and Television Arts) fellowship award in London this weekend. He remained humble while accepting the award but, during an interview, Miyamoto said that he never considered videogames to be an artform on par with film. "It's a great honor that my name might be listed as a fellowship member along with such a great director as Hitchcock," he said. Other winners of the BAFTA Fellowship include Steven Spielberg, Woody Allen, Anthony Hopkins and Stanley Kubrick. 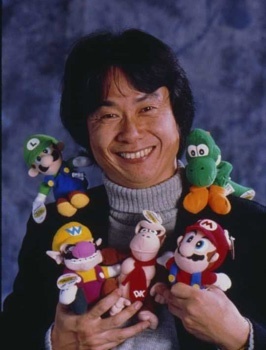 But Miyamoto dismissed the idea that his work was anywhere near as influential as other winners of the award. "I have never said that video games [are] an art," he said. During his acceptance speech, Miyamoto humbly accepted the BAFTA Fellowship on behalf of all of the people who have worked on his games. "I am embarrassed to receive such an award, so I am taking it for everyone who has worked with me in the last few years and I thank them for all their hard work," he said. He also challenged the videogame industry to take playing games together with other people more into account. "I am more interested in atmosphere where player can interact with each other," Miyamoto said. "Our imagination and creativity takes us to countless fascinating places were we hope to make new experiences for people of all ages. This I call a recipe for joy. "I hope the videogame industry continues to develop with both entertainment and character." Miyamoto joins Will Wright (The Sims) and Nolan Bushnell (founder of Atari) as the two other representatives from the videogame industry to have received a BAFTA Fellowship.